Well color me… orange. With maybe a little yellow. 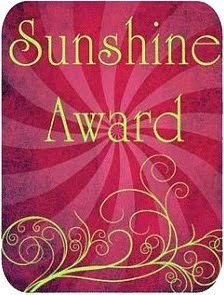 Emmy, from The Art of Making Art has nominated me for the Sunshine Award. I can only say that I am honored that someone thinks my blog sends a bit of sunshine their way. The blog-o-verse is a vast place, to have people find my little corner of it is such an honor to hear. 1. Post the image of the award. 2. Write an acceptance post including a link back to the person who nominated me. 1. I am not a fan of yogurt. Unless it is light. Vanilla or peach. Also it must have granola. Fruit is also important. So really, a parfait is just about the only way I can eat it. 2. Three of my favorite TV shows right now are British. Which leads me to believe I am meant to be British. Said shows are Sherlock, Doctor Who, and Downton Abbey. 3. I am not a fan of the Lord of the Rings movies, but I really like The Hobbit films. 4. My new obsession: Sweet Potato Chips. And not the tortilla kind. Actual potato chip ones. Yum! 5. Polar and Vortex are now right up there with retarded as my least favorite words! 6. I am REALLY liking my job this year. Teaching 6th grade intervention reading is not something I ever saw myself doing. But for the most part, I like it. 7. I've been traveling a lot in the last few years. New Orleans, Milwaukee, Detroit, Dallas, Colorado, South Dakota, North Carolina… this year it's Guatemala and Washington DC… next year Vegas and ??? It's been such a blessing. I've learned so much about myself and the people in my life. 8. I've been reading a lot of books lately, doing some reviews for Christian authors. 9. If I could have any talent/skill, I would love to be able to play piano, proficiently, by ear. 10. My classroom staples: post-its, purple EnerGel pens, my laptop and coffee. Last, but NOT least… do you have a blog I should check out? I'd love to add more to my list. Please leave a note in the comments below!